and soul. The sense of community is everywhere, from the shared joy of a book launch to the palpable loss of fantasy author Sara Douglass, who died shortly before the conference began. Overall, Conflux was a cozy get-together, where likeminded fans and writers mingle and enjoy their love of SF and Fantasy. everything here at this time, but a full report will appear soon on the Adventures in SciFi Publishing website. Keep your eye out for it. In the meantime, special congratulations go out to Patty Jansen, a major figure in the Australian writer’s scene. She was kind enough to spend time talking with me during the entire event. Having won the second quarter of the Writers of the Future contest, the fruits of all her hard work have now gained her global attention. It’s well deserved in my opinion. Looks like I’m going to Conflux 7, the seventh speculative fiction convention held Saturday October 1 to Monday October 3rd in Canberra. That’s in Australia Mate! The first was in 2004 and was the national convention (Natcon) for that year. Since then, Conflux has become one of the most well known cons in Australia. This year’s special guests include Kim Westwood (Author), Natalie Costa-Bir (Editor), Lewis Morley and Marilyn Pride (Artists), and others. Check the Conflux website for more details. Spending five full days at the 68th annual Worldcon in Melbourne Australia was an incredible experience. It was my first Worldcon, and as a lover of the Sci-fi genre, I imagined complete Sci-Fi immersion from morning till night would be easy. It’s a dream come true don’t you think? However I must admit that by the end of the 5th day, I was absolutely exhausted and in desperate need of rest. But now that I’ve had a few day to recuperate, let me share a journal of my experiences during this amazing event. After registration, there was a small rush to sign up for Kaffeeklatsches. Being my first con, I soon realized how important and fascinating these meetings are. A Kaffeeklatsch is a private sitting of about ten people with authors, artists, and other notable persons attending the convention. Enjoying a cozy cup of coffee like this is a key feature of Worldcon, and I was lucky to start my first day with celebrated writer John Scalzi (President of SFWA). John as you may know is a well known blogger, and wrote _The God Engines_, which was up for a Hugo this year. He is also an incredible personality. Full of energy and humor, his exuberance and passion for Science Fiction was incredible to be around. I for one consider myself quite lucky to have met him from the very start of my Worldcon experience. After the Kaffeeklatsch ended, I met up with Graham Storrs , a friend of mine, and author of _Time Splash_. Graham lives in Australia, and I was really happy to meet up with him and catch up on his newest work. But we couldn’t talk long, because we both wanted to jump into the many panel discussions taking place. My first session was called “Australian SF vs. The rest of the world”. Chaired by Lucy Sussex, Peter M. Ball, Tehani Wessely, and Jack Dann , it was an appropriate session to watch, given that I was in Australia. The panel discussed challenges faced by Australian writers trying to get published in a country where the population (given its enormous land mass) is quite low. For most writers, breaking out into the mainstream market means getting published with US, or British publishing houses. Accordingly, the voice and style of writing often needs to be tailored to the respective target market. It was impressive to see that given all these challenges, Australia produces some great science fiction. This was evidenced by the panelists themselves, and by other notable authors like Greg Egan . Greg sadly, was not at the convention. 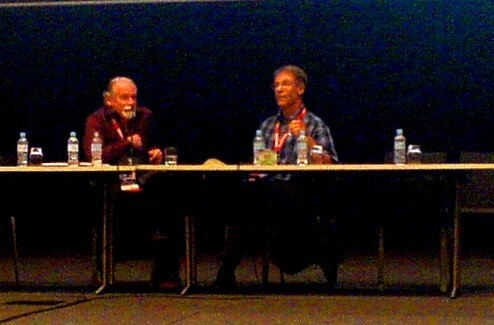 Friday began in the large Plenary hall, where Guest of Honor, Kim Stanly Robinson and Robert Silverberg spoke about their life experience in the Science Fiction field. What can I say? Watching these two great men talk for an hour was incredible. Going back and forth candidly, Stan and Bob discussed a number of subjects; archeology, ecology, utopian societies, World War II, economics, etc. It was all interesting, but for me the most memorable part was their discussion about changes in the SF market over the last few decades. Of course Robert Silverberg has been writing over 50 years, so from his point of view, the reduction in pay rates over the decades was lamentable. He pointed out that writers now get paid less per word than he got back in 1960. On a more positive note, he and Stan reminisced about many modern day advantages. For instance, both had wonderful memories about the introduction of personal computers, and how much easier it is to go about the laborious process of writing. 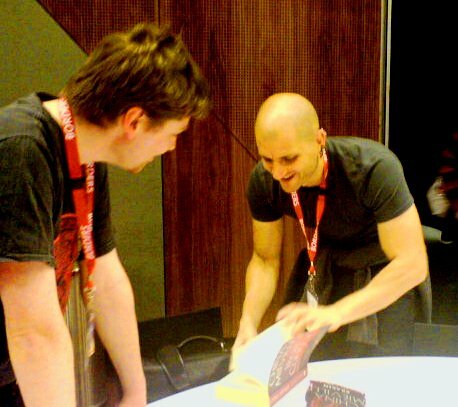 Later in the afternoon, I was also fortunate to meet China Miéville . China’s book, _The City & The City_, was up for a Hugo and many people were keen to meet him. But he had cancelled his Kaffeeklatsch signup due to sudden scheduling changes. It caused quite a stir with the many eager fans waiting in line. However, by noontime and without announcement, his Kaffeeklatsch was reinstated. And only by accident did I happen to walk by and find the signup sheet just laying about unnoticed. What incredible luck! Of course, meeting China in Person was an unbelievable experience. Here before me was a true intellectual, yet open, soft spoken, and quite modest. A writer who strives to create something other than the typical thrillers our genre has been gravitating too. In fact, I asked him straight out if he was attempting to buck-the-system, and write books that are more literary than what is typically expected by readers. As best as I can remember, he said, “I know not everyone will understand my writing, but I am not giving the readers what they want. I am asking the readers to want what I am giving them.” What an answer. And since China took home the Hugo for best novel, I think the readers have shown they want what he has to give. Friday evening, and there were many parties at the Crown Plaza Hotel, Worldcon’s official party and socializing meeting-place. After a few rounds of unabashed merriment, I found myself on the lower level, where a party was being held by the Canberra Speculative Fiction Guild (CSFG). 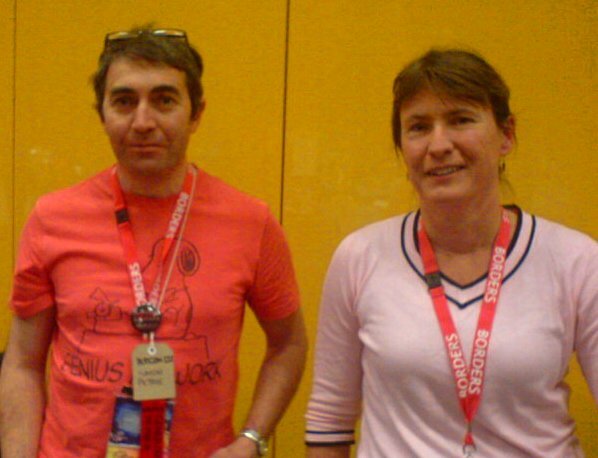 There I met a number of interesting personalities in the Australia writing scene. I first met Donna Maree Hanson , an editor and writer for the CSFG. 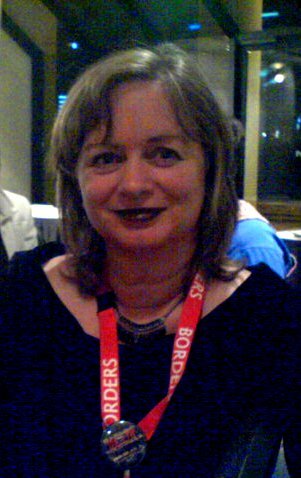 She was very cordial, and explained CSFG’s history as a writer’s group formed back in 1999 after Aussicon3. Donna then introduced me to other writers in their group. 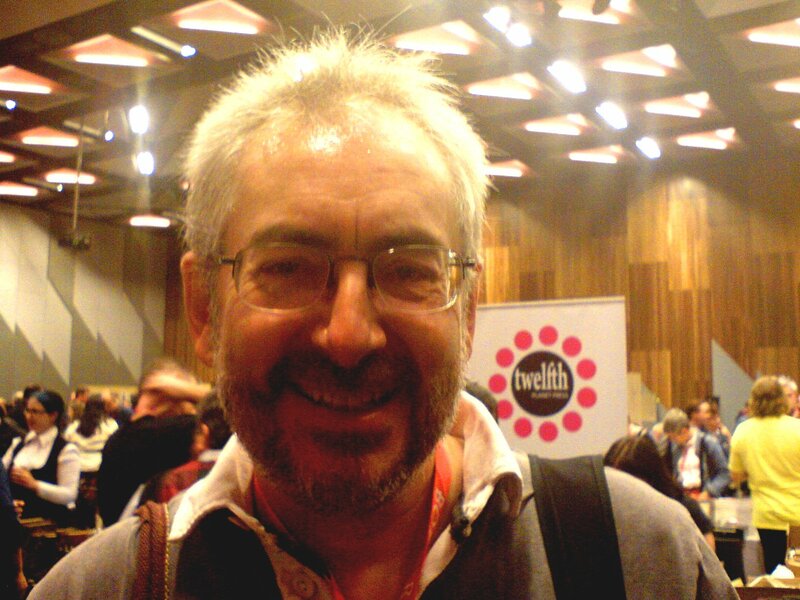 One member was Simon Petrie , a research scientist and speculative fiction author living in Canberra. Simon and I met up later in the convention and he showed me his work published in Andromeda Spaceways Inflight Magazine (ASIM) , a fantasy and science fiction magazine published out of New South Wales, Australia. I wasn’t familiar with ASIM, but I soon met up with one of their editors, Patty Jansen . She took some time to show me a broad spectrum of work that has been published by the magazine. In all, I was quite impressed by everyone in CSFG and ASIM. And now that I know more about them, I look forward to seeing their future work. Saturday, and a big day for Plenary sessions. 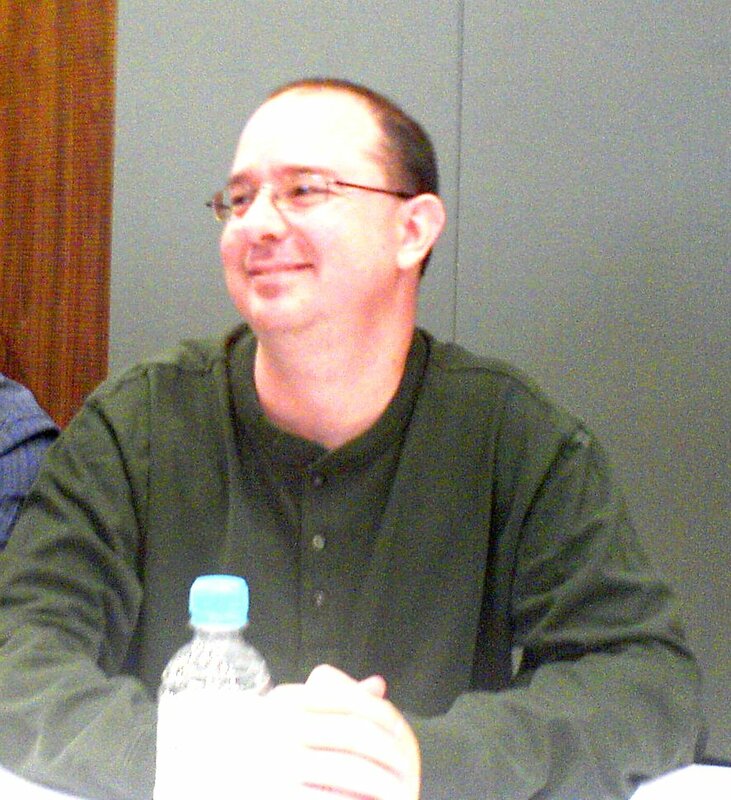 The first session was entitled, “Time and the Novel”, and was given by Stan Robinson about Science Fiction as a literary art form. Stan spoke elegantly about Modernist literature. Quoting from works of Marcel Proust and Virginia Woolf, he explaining how Modernist and Post-Modernist literature helped shape Science Fiction. He pointed out that simple rules like, “show don’t tell”, can sometimes overly restrict. And it is important for writers to use, deep-time exposition, to establish the future history of a novel. Long exposition, in his opinion, is fine as long as it maintains the reader’s interest. And pointing out the trend towards fast, dramatized dialog, Stan made the case that modern SF panders itself to the less knowledgeable reader, and takes the genre away from its literary roots where it might be better served. I sat enthralled by Stan’s lecture, and I came away from this session with a much deeper understanding of what Science Fiction is, and what it is capable of becoming. The next Plenary session was about marketing and selling Short Stories. The panel included Cory Doctorow , David Levine, Lezil Robyn, Robert Silverberg, and Angela Slatter. It was a very lively discussion, and focused on two areas. First was a need by writers to make contacts that can help get around slush piles. Bob Silverberg made the point that often luck is sometimes needed to avoid being forgotten in a sea of paper. The second point the group talked about was the need for persistence. Since slush piles are unavoidable, the group urged that one must be professional, and submit a high number of pieces in order to get noticed. David D. Levine also made the case that even with a high number of rejections, editors will still note an author’s attempt, and accept work when the quality improves. On Sunday, I had the pleasure of listening to Stan Robinson talk about his ideas on ecology and climate change. He talked for some time about technological development, and its negative impact on smaller life forms. One consequence, he pointed out, might be the destruction of the sea’s entire food chain. He also talked about possible solutions, but made it clear that “purity”, in a philosophical sense, was not a solution. He urged everyone to stay clear of fanaticism, and to consider unpopular solutions if needed. For instance, lowering our carbon footprint should include nuclear power, even though use of that technology brings with it a number of potential dangers. Overall, I found the discussion quite poignant, and I give Stanley Robinson a lot of credit for his stand on ecology. Between sessions, I ran into David Levine . He was nice enough to sit down with me for some time and discuss the challenges that writers face getting published in greater detail. David himself is a well respected writer, and getting his personal insight on publishing was a real treat. In my opinion, it is chance meetings like this, that make Worldcon special. The next Plenary session was about the life work of Jack Vance. I myself am a big fan of Vance, and was very keen to hear the thoughts of the panel made up by George R.R. Martin , Terry Dowling , Mark Olson and Jonathan Strahan . They began by talking about Vance’s wonderful stylized form of minimalist writing. They felt his prose created a hypnotic and soothing affect on the reader. George Martin also commented at length about Vance’s broad repertoire of stories. Some funny, some sad, some weird. But the panel also recognized faults in Vance’s work. For instance, the plot and ending would often have problems, or seem odd at times. Still, everyone agreed that Vance is arguably, one of the greatest Science Fiction writers of all time, and any faults were simply pushed aside by a writing style that few are able to imitate. Of course, Jack Vance is quite old now, and no longer able to write. Even so, the panel talked about the possibility of a revival. This was evidenced by a recently published anthology in honor of his Dying Earth series , and the possibility of movies. The next major session was about the exploration of Mars. 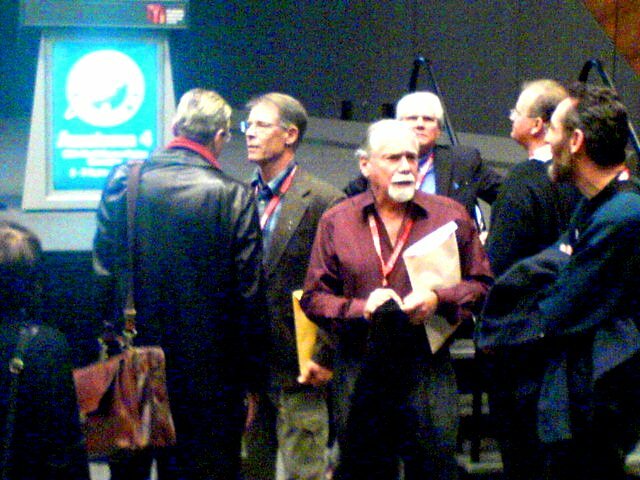 Stan Robinson, David D. Levine, and Jim Benford discussed the recent discovery of methane in certain localized areas of the red planet. They stressed that this is quite intriguing because methane can be produced by two processes. One is by volcanism and tectonic plate movement, the other biological. Now since Mars is geologically dead, it is possible to consider that some biological process is responsible. If so, it raises interesting questions. The panel talked about the many challenges of going to Mars in order to find out the truth, along with the moral ramifications. If indeed there is microbial life there, the panel considered man’s right to disturb it. Overall, the discussion wasn’t about little green men, but I still found it thought provoking. 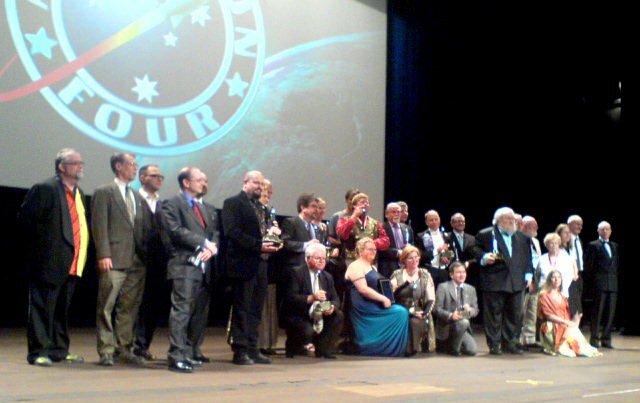 All Hugo winners line up. However, it is worth mentioning that this year’s voting for Best Novel resulted in a tie. Fist place was shared by China Miéville for his book _The City & The City_ along with _The Windup Girl_ by Paolo Bacigalupi . I was very pleased with this result because I think both works exemplify the great potential of Science fiction. Sadly, Paolo was not there to accept his award, but China did get up on stage. I had asked China a few days earlier if he expected to win, to which he answered quite frankly, no. He was quite modest about his chances, and I think this explains why he appeared somewhat shocked and out of breath as he got up on stage to make his acceptance speech. The final day, and it felt like things were winding down. Still, I attended some good sessions. There was one on the Bioethics of Terraforming, given by Stan Robinson, Greg Benford, and David Levine. There was also a great session on selling short fiction. But what I remember most about the last day was my final Kaffeeklatsch with Jay Lake . Even though Jay was suffering from health issues, he was brave to come to Australia and speak with the fans. Soft spoken and extremely personable, he talked about the state of Science Fiction, and why Sci-Fi sales were currently weaker than Fantasy. Jay explained in a very thoughtful manner, that Sci-fi suffers from the fact that it is non-normative. A kind of storytelling that starts with a environment where one introduces a disturbance: aliens, technology, war, etc. The outcome of which is an irrevocable change to society. This is in contrast to the normative story telling of Fantasy, which typically starts with a happy society, which is then disturbed by a dragon, wizard, and or demon. At which point, a young boy/girl comes of age and finds a magical sword, ring, helmet, spear, whatever; and then goes off to battle until said society is back to its normal state. This explanation I felt was extremely interesting, and does address why folks seem to have issues with Sci-Fi. For the most part, Sci-Fi brings news of change, and the fact that things will never be the same. I suppose not everyone likes that kind of storytelling. It can be scary. But I for one, feel it is closer to reality. Do we not live in a world that is forever changing? On that note, I can say that Worldcon has forever changed my life. I learned so much, met so many interesting people, and made some really great new friends. How I can I ever be the same afterwards? I won’t be. In closing, I can only apologize for leaving out so much detail from this report. I am unable to mention all the sessions that took place, nor am I able document fully the large number of fascinating discussions I had with fans and writers during breaks, lunch, and socializing events. Some of it will be lost in time, but I hope to be at future Worldcons and continue the experience. For your information, Next year’s Worldcon is in Reno Nevada , an easy travel destination for Americans. So I look forward to a big crowd, and lots of SF fun. Perhaps the only 'true' SF film ever made: Things to Come (1936) is a British science fiction film produced by Alexander Korda and directed by William Cameron Menzies. The screenplay was written by H. G. Wells and is a loose adaptation of his own 1933 novel The Shape of Things to Come and his 1931 non-fiction work, The Work, Wealth and Happiness of Mankind.